While climbing aboard your calèche along Rue de la Commune in Montréal's Old Port, you may catch a glimpse of what looks like brownish-grey freight containers hastily stacked about 12 layers high across an artificial harbor in the Fleuve Saint-Laurent. A closer look will reveal windows, at which point you will come to realize that the haphazard concrete Jenga blocks are actually apartments. 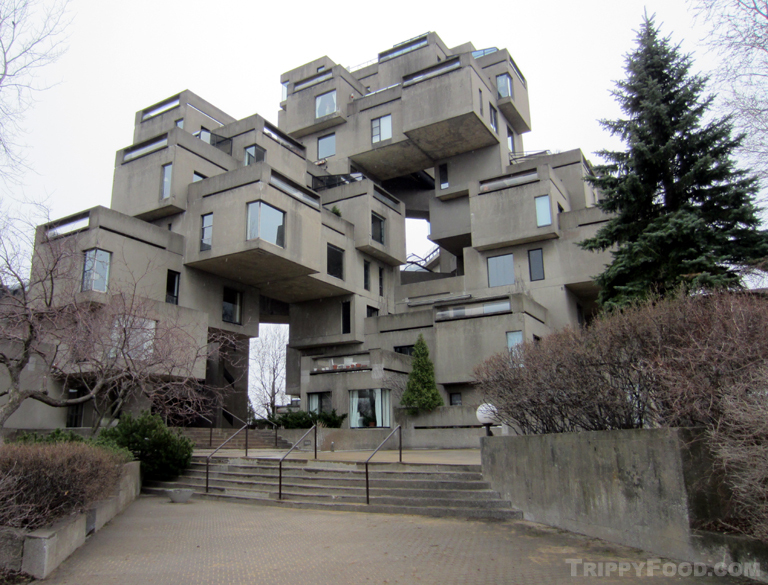 This conglomeration of cubes comprises one of the most iconic and recognizable structures in all of Canada - Habitat 67. The dwellings are easily accessible from Old Port via Rue Mill or Autoroute Bonaventure, but keep a sharp eye or you may end up on the opposite side of the Ste. Laurent. Habitat 67 sits close to the end of a tapered man-made peninsula called Cité du Havre that juts out into the river, and as the apartments are occupied (and difficult to get into), you'll need to park on the shoulder of the turnaround on Pont de la Concorde. One might ask, "With all the historic sites and cultural activities that abound in Montréal why would one bother to gawk at an apartment complex"? The simple answer is that Habitat 67 is a historical and cultural experience that is often overlooked in Canadian tourism guidebooks with more than immediately meets the eye. The structure itself was originally designed as a thesis by architectural student Moshe Safdie while attending McGill University; it gets its name from being sponsored as a project to construct a pavilion for Expo 67 (the 1967 World's Fair). When initially built, it was intended as temporary residence for heads of state and visiting dignitaries attending Expo 67. The structure was initially financed by the Canadian government but in 1985 its tenants formed a partnership and purchased the property; Architect Moishe Safdie owns one of the penthouse apartments and continues to oversee and advise tenants on restorations and changes to the property in an effort to maintain the integrity of the original design. There were originally 158 apartments which used 354 identically-sized concrete boxes, but over the years some of them were integrated into existing apartments; there are currently 146 apartments utilizing anywhere from one to 8 cubes each and having between 225 and 1,000 square feet of living space. You can't get a feel for how precariously stacked the cubes appear to be until you walk around beneath them in the common areas on the ground level and some of the lower levels accessible by stairs (there are elevators built into the design that take occupants to the upper floors, but these are secured and inaccessible to tourists, unless you somehow manage to sweet-talk one of the tenants to give you the nickel tour). 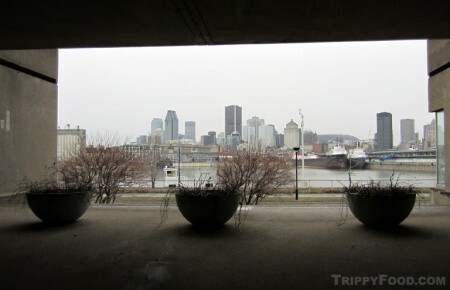 Because of the location, most apartments are afforded spectacular views of Old Port, Île Sainte-Hélène, Île Notre-Dame and the Ste. Laurent River, which brings us to Montréal's hidden secret associated with Habitat 67. Surfing Habitat 67 on Montréal's Ste. Laurent River from Trippy Food. 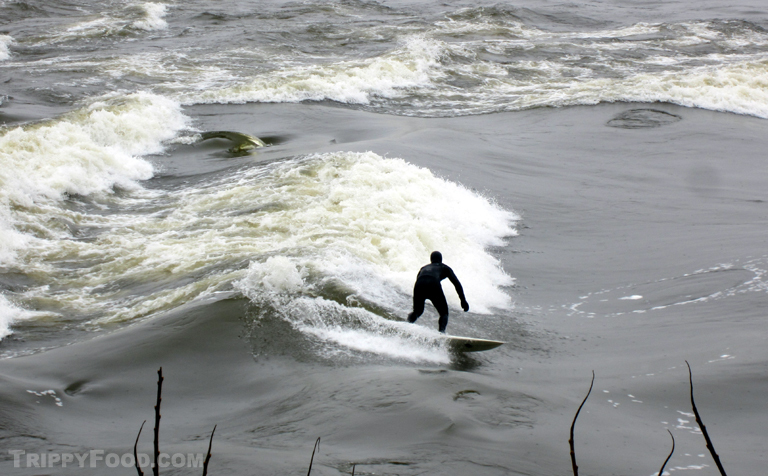 This entry was posted in Montréal and tagged apartment, Canada, Cité du Havre, Corran Addison, Expo 67, Habitat 67, Montreal, Moshe Safdie, Pont de la Concorde, Quebec, Saint Lawrence, Saint-Laurent, Ste Laurent, surfboard, surfing, wave, World's Fair. Bookmark the permalink.